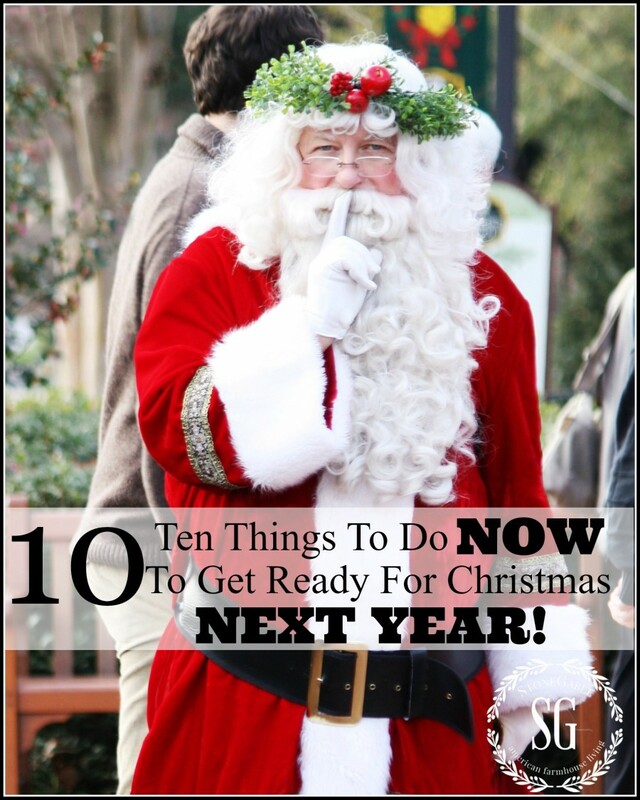 10 THINGS TO DO NOW TO GET READY FOR NEXT CHRISTMAS! Yes, you read that right! I know that Christmas is just a few days away. But you CAN start now and begin getting ready for Christmas… next year! 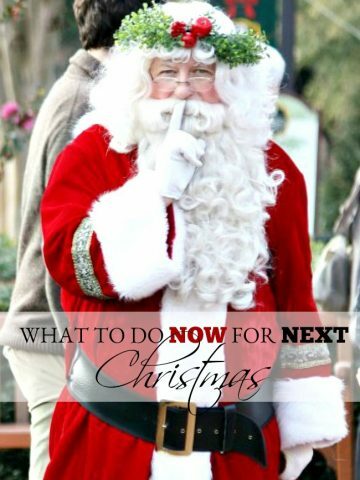 Use these smart, simple, common sense tips to get a head start on Christmas 2015 and enjoy a little Christmas spirit all year long! 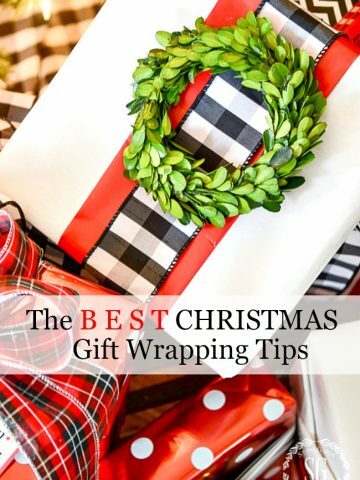 You might think that this is a little crazy, but if you decide now you can get great buys on wrapping paper, ribbon, gift tags, throws, wreaths… and all other sundry of Christmas thing! And Christmas looks so pretty when colors and patterns work together! My colors for next year are red, black and white. I know that I have been stuck in the black and white rut, but I just love it with my house! Don’t go overboard! Three designs are plenty.Two would even be great! 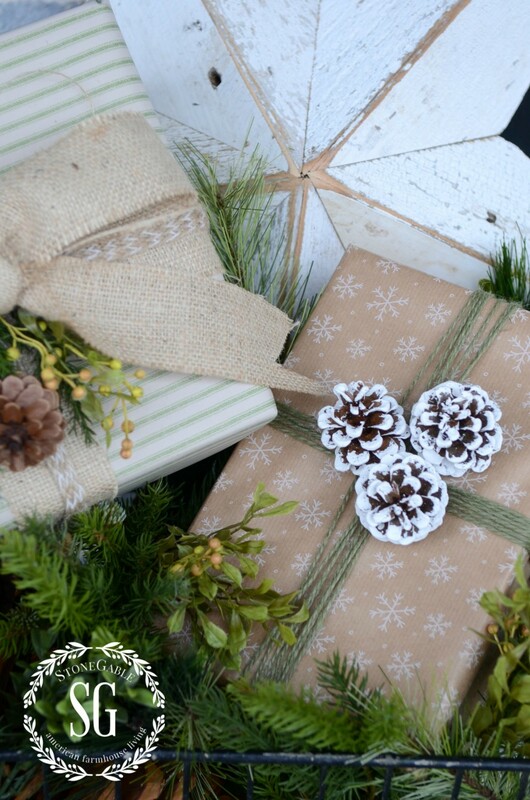 If you get a kraft paper or white paper it can be used for more than Christmas! This year I bought a green and natural pillow ticking paper that I’ll use during the year! I look for wrapping whenever and wherever I can find it. This year I’ll be looking for a great black and white check or plaid, something natural and something with red in it. This is very economical when you think of it. Ribbon can be rolled up and used again and again! And how easy is it to tie a bow? Real ribbon also looks amazing! Since I have been on a black and white kick for the past 4 Christmases I have amassed a large quantity of black and white ribbon (all on sale). No need to buy more for next year… just reuse them! This is a fabulous, fun, time and money saving thing to do! 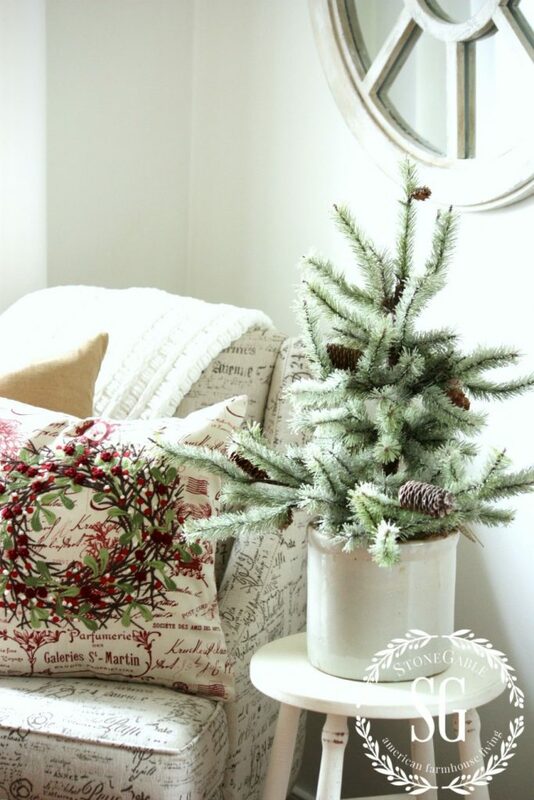 Buy Christmas pillows, stockings, dishes, pj’s… anything that is Christmas themed now for next year. Stores have huge price reductions in items with Christmas details right now! Don’t wait until next fall… they will cost a whole lot more! I’m looking for two Christmas duvets and euro shams! I’ve dreamed of having Christmas bedding for years! This is the year to really evaluate your Christmas decorations! Only keep what you love and use!!! It’s time to get our Christmas decorations in order! 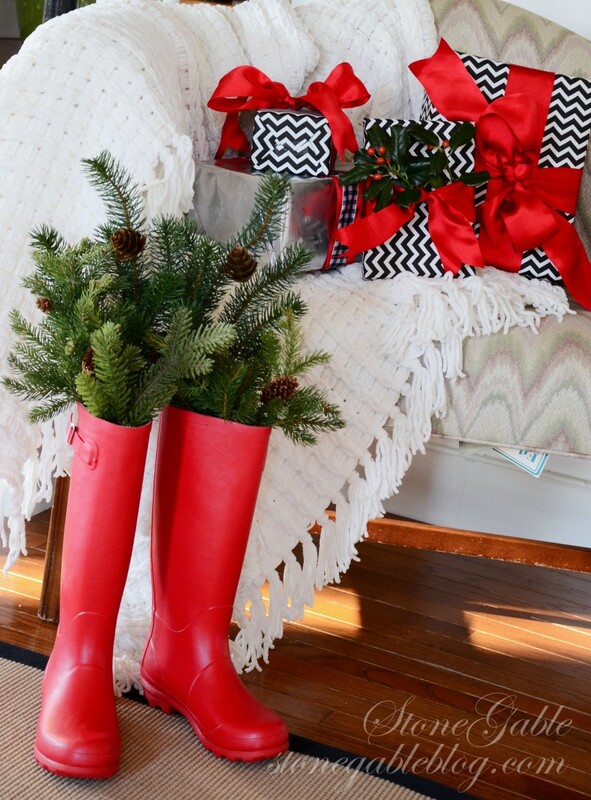 Here is the BEST CHRISTMAS ORGANIZATION TIPS YOU WILL EVER GET! REALLY! 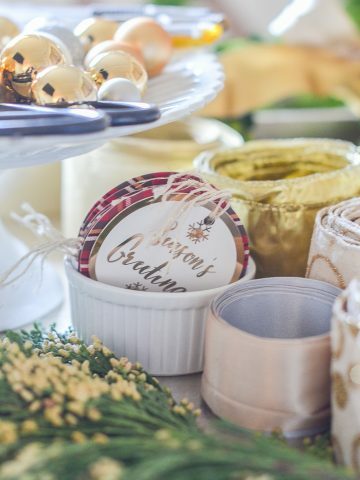 Put the decorations that you need to find and use every year in a specially marked box. Like your tree skirt and stockings. I like to put out my manger scene first… so I keep them in a special box and know just where they are. This is the voice of years of searching the basement for that one special thing talking to you! The first of December is not the time to start that burlap ruffled tree skirt (that’s what I’ll be making). Get an early start! 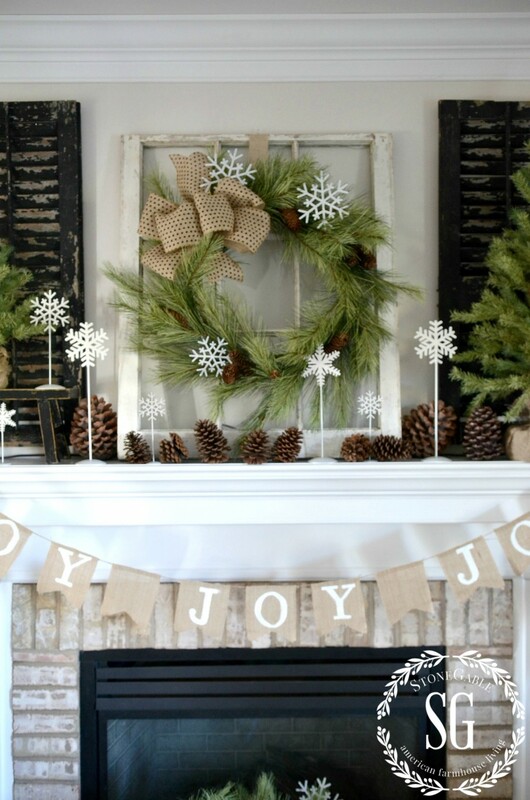 Just think how beautiful that JOY banner will look across your mantel next year… you know, the one you make in June! With Christmas 2014 only a couple of days away this post may seem a little… or a whole lot… premature! Enjoy the Christmas moment… and as soon as Christmas is over start preparing for Christmas 2015 and enjoying it now! This is the most beautiful photo of a Santa. Love it! You inspire me to take my time when wrapping gifts to be a beautiful packages. Well now, every year I tell myself that I’m gonna get organized so I will be ready. But I seem to be in the same hurried rush every year. What a lovely idea . You see every year I have ideas and things that I want to make but I all ways find myself not having enough time .I also like the Christmas gift list through out the year. Thank You . I needed this! Make sure to post another one like this after *this* Christmas, too! I feel like I’m really ahead of the curve because I already do all of those things! 😉 Next year I’m doing “Candy Cane Lane” with red and white stripes. I’m excited! One thing I really need to work on is my storage organization. This year I think I need to invest in some clear tubs and some of those divided ornament ones. Your Christmas theme sound delightful and delicious! Love these super & very wise ideas, Yvonne! Now that I’m in a condo, my Christmas decor was in a bin in a storage locker in the basement; a bin I can’t reach too well. I wanted to decorate some areas early in the month & was frustrated because the items I needed were in the bin so this year (after the holidays) I will put most of the decor items back in the bin (for the locker) BUT reserve a drawer to hold the early-December decor I was wanting for this Christmas. I like your idea of using 2 or 3 different papers. I bought one huge roll and am tiring of looking at the same paper but am trying to vary it with different ribbon colors. May I add one post-Christmas idea? I am forcing myself to get out the glue gun & sticks, etc. in the New Year and REPAIR any decorations that need repair before packing them away for next Christmas! (Love your idea of buying & listing presents you buy throughout the year.). Merry Christmas, Yvonne, thank you for your fantastic & beautiful blog! I was visiting with my best friend, Cindy, today and she told me about this post! Somehow in the holiday rush, I had missed it! Great post, Yvonne! I really need to get more organized and do a little at a time throughout the year! Being a Virgo I’m always trying to be organized! This idea is right up my alley……. Another Tip….. I go through all my Christmas cards and pick out all those that I can use next year as gift tags or some of my favorites get framed and put in different areas of my home…..I love to see the smiles from friends and family who recognize their cards! Some I just place on top of gifts wraped in white paper…..my daughters have been doing it now for some time. We try to salvage some of our older ones, and put the date on the back…my grandchildren love doing this too….. Thanks for helping me jumpstart next Christmas! I have a gift closet, but your list reminds me that I need to LABEL the gifts I put in there (this year I bought two copies of a favorite old book, and found myself on December 20 pondering, “Let’s see…is this last copy the one for my brother’s Christmas, or my friend’s birthday?”. And, now that you have suggested it, I will also put these items on a master LIST in the closet! 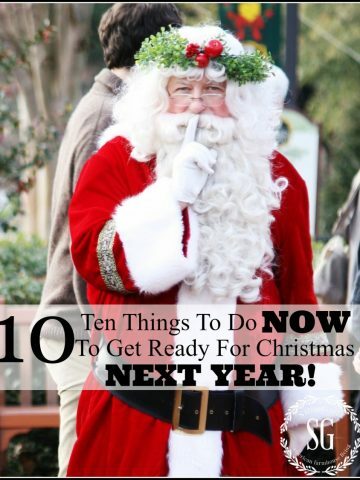 Oh, yes. . .I’ve been making lists and getting ready to re~organize the 2015 Christmas decorations and decor!!! Christmas 2015 will be scaled down, as we will be going to sons for all the festivities!!! 2015 gift wrap has been purchased!!! Thank you for all your fabulous tips!!! Thank you for these suggestions. I practice some of them already…always packing away with next year in mind. My most recent post was about how I pack decorations away. Your blog is fresh, attractive and helpful. Wonderful tips…you mentioned things I have done all my life. Nice to know someone thinks the way I do. All great tips, Yvonne! I am an organization freak–hubby calls it freaked out!—but guess who he comes running to when he’s searching for something? LOL! We have so much in the way of holiday decorations that I would go bonkers without labeled bins and lists. I keep saying I absolutely will not purchase one more thing, but the next holiday rolls around and there is this lovely piece and, well, you know! Hubby says if I were a fish I would never make it to adulthood because all someone would have to do is dangle some bling on their fishing line and I’d be a goner. I am getting better, though. I’ve just always had a weakness for holiday decorating (I blame my parents for that as they BOTH were great at beautiful vignettes–something I wish I could come up with as easily as they did). So excited tomorrow is Christmas Eve! Hope yours is perfect! A great plan indeed…have a great one this year!! I am definitely going through all my Christmas decorations and getting some clear bins (have them in bins-but not clear) to sort. Tired of always missing one decoration I know I have, but can’t find! Great tips, giving me incentive! Thanks! We all love the excitement of Christmas and the preparations involved. One of my favorite things to do is decorating the house for this magical time of year. I love your ideas because it helps us to go through what we will keep and other things that we will let go of. Bargains on ribbon, wrap, and ornaments makes it easier on the pocket if a color theme is chosen. I also like the idea of organizing next year projects and having them worked on throughout the year. We won’t be in a panic trying to hurry and get the projects done if we can think about it throughout the year and work at when you can relax. Thanks for sharing; great tips! Great tips!! I need to have that special place to put gifts. I buy them throughout the year, especially when we travel. Truth be told, if they are close at hand, I’m tempted to gift my recipient early! Out of sight, out of mind. Be sure not to buy clothing early as the return policies are strict. Another tip I learned was to pack bins by room. You can work on a few at a time the following Christmas that way. I switch things around of course but the basics are ready. And the designated bins go to each room instead of cluttering up one big space. Thank you so much! I wanted to mention that because I simply love your wall color in your living room, I used the Silhouette recently in a bathroom and our office. Everyone loves it…what a perfect color! I’m a Costco lover. I get the ribbon and the wrapping paper there and it lasts for YEARS . The family joke is “how many years have you had this wrapping paper mom?” Oh…years and years! It truly is the most economical way to go. I doubt you could get your black and white, but I love silver and gold with ribbon. I love Costco too! 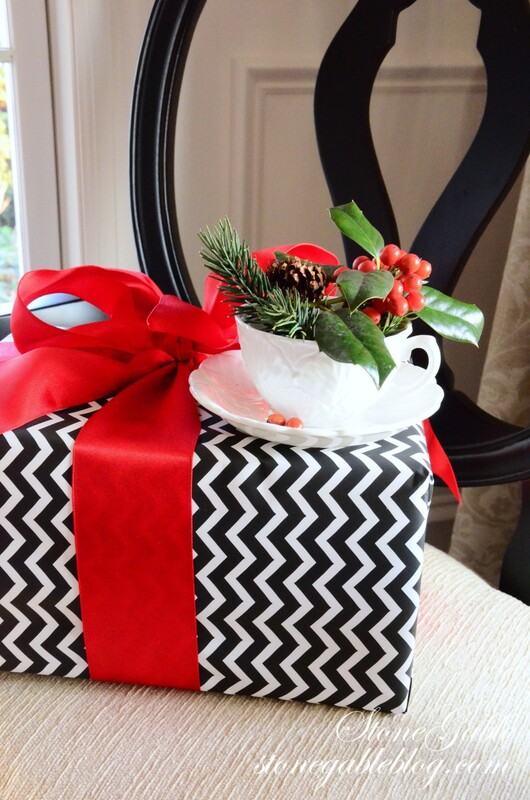 You are right, they do have great ribbon… and gift tags! You are so dear, Dawn!!! I happily bought 3 eight foot long strands of wooden red bead garland for my tree for only $2.92 a piece! I learned NOT to put popcorn strands on my tree after my dog ate the bottom half. So funny… I hope you dog was alright! Love your blogg!! The wrapping and organizational ideas are GREAT!! Hope I can remember them! Wonderful ideas, Yvonne. I’ve been honing my wrapping paper for awhile, now. I like the idea of using real ribbon and think I will integrate that. I really want to work on crafts year ’round. I’m thinking about making reusable, fabric gift bags. LOVE the idea of fabric gift bags! I love the idea of saving ribbon. My favorite brand of ribbon is May Arts, and I cannot find in my local craft stores so I ordered a lot of it off Etsy. I’m going to recycle it and reuse the ribbons I used in my decorations for next year. It’s a top-quality brand of ribbon and I don’t want to have to buy it again next year. Thanks for the great tip, Karen! Another GREAT post…per usual. And may I say Santa is SO adorable!!! Yvonne, Merry Christmas. I love your posting, your spirit and your thoughts on home and family. I don’t think I’ve ever enjoyed a blogger’s postings more than yours. Your daily email is like a Christmas morning gift. You are a JOY and a Blessing. Question: What do you mean by “real ribbon” in your #4 Buy Real Ribbon post? Donna, you made my day!!! I’m so glad you like my daily newsletters!!! Your organization for Christmas next year was a great posting. I love thinking ahead and you helped me do that. Merry Christmas! What a wonderful list of great tips! I would love to share this on my blog as a guest post next week if you are interested. Just let me know. In the meantime, I am heading out to share this on G+ and Twitter! Merry Christmas! Love this post. It’s reassuring to know I’m not the only one who starts planning for next Christmas during the current season. Do you have a website you can recommend to buy ribbon? My husbands family is from your exact area in PA. I miss visiting. Great rules to follow….we downsized this year…instead of decorating 3 areas I had one great room . You’d think it would be easier but I had a hard time parting with some of my stuff…..I also keep my color theme to flow with my home colors….so much easier. All you talented bloggers help me pull everything together. Thanks for all your postings. I’m a big fan…and you sure do make my life easier! These are great tips and I am going to try and use them. Thanks so much. Great tips, Yvonne! I borrowed your idea of the clear plastic bins for storage of Christmas decor and it was the BEST thing I have done for Christmas decorating ever. So so easy to find exactly what you need when things are sorted into smaller clear bins by colour, item etc. I wrote two posts on my copy cat system and already have more clear bins to add to it this year. 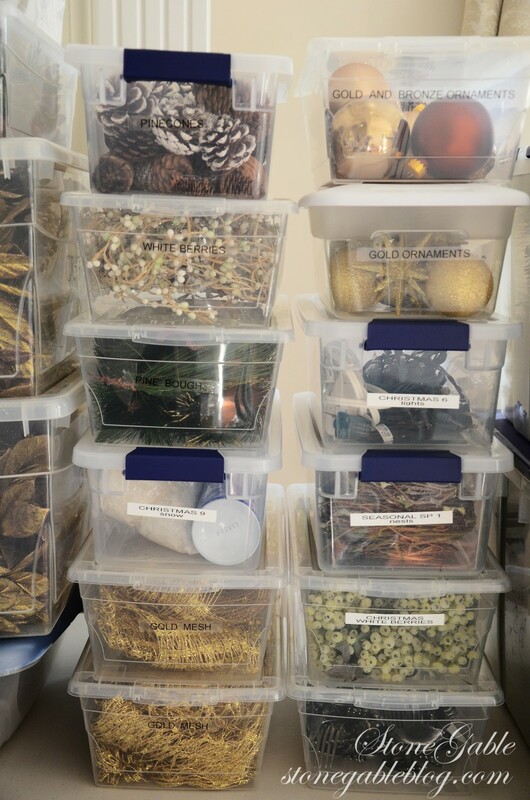 From your tips this year I am going to add the Christmas storage space in a closet and make a few homemade items ahead of time. I do not like Christmas shopping and it is even worse when I leave shopping too late. I’m also keeping an eye out for pretty plaid flannel sheets for our king bed for next year. Thanks for your friendship, great tips and decorating inspiration. Wishing you and your loved ones a very Merry Christmas and all the BEST in the New Year! Elizabeth, I just saw some great flannel sheets at LL Bean! All great tips! In anticipation of after Christmas sales I like to check out my favorite fine gift shops for realistic holiday greenery and big beautiful bows for the next year’s decorating. Then I know exactly where to go as soon as the sales begin. And I don’t waste time looking around a crowded shop with other bargain hunters. If I know in advance what I want at a sale I can get in and get it (if it’s still there) and get out! Great tips! I moved this past April & when I put up Christmas last year I did most of this. Since I am in a new house now I am making pictures before I take everything down so I can 1 remember what I already have & 2 where it was placed. I can always go to phone pics & check before I buy more of what I have. Thank you again for inspiing me! Love seeing your beautiful images again of your Christmas decor….I love shopping the after Christmas sales for Christmas decor….and you have inspired me to plan my Christmas theme for next year! This is all such great advice Yvone! I will definitely be planning to do #9. That’s the one thing I never do, but should and it always leaves me falling so behind each year. This is all excellent advice. I used to be much more organized and would always shop all year for gifts and even wrapped them. What I need is someone like you at my elbow, reminding me to begin making decorations early! Wonderful list and a perfect gift to us all. Happy Holidays to you and yours! A huge thanks to you Yvonne! You’re so proactive, me too ;-} I’m going to use your great ideas, to keep the Christmas stress to a minimal. All I need is to remember to do the prep all year long (*sigh*). Great tips, Yvonne! My goal when I take things down this year is to have everything 100% organized. I was smart when I decorated and got rid of things that I didn’t want anymore by taking them to school and giving them to the kids. They loved it! Good for you, Paula!!! LOVE all your organized tips and your FABULOUS blog! Merry Christmas from StoneGable! Yvonne, thank you once again for providing excellent organization tips. You are the BEST! 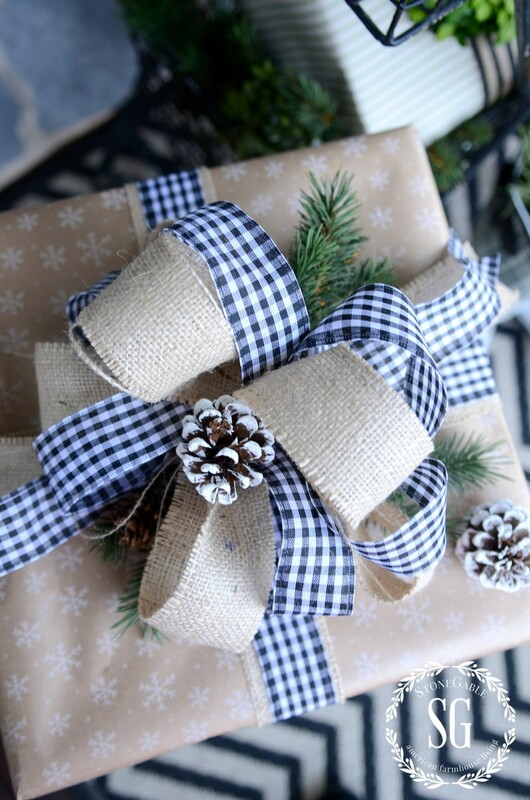 Shades of blue for Christmas 2015 and black and white plaid. I love your use of plaids. Merriest of Christmases and a Blessed New Year to you and your family.